Minnesota Business Magazine Women Who Mean Business - Elise Hernandez - ideal System Solutions, Inc.ideal System Solutions, Inc. In February 2015, Minnetonka-based technology company Ideal System Solutions was awarded a stake in a $20 billion federal contract. Under the helm of president and CEO Elise Hernandez, Ideal System Solutions is one of 65 firms that will share a $20 billion, 10-year “government-wide acquisition contract” for information technology needs. Hernandez didn’t always see business in her future, though. 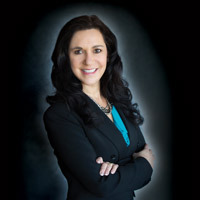 After graduating from the University of Minnesota in 1991 with a bachelor’s degree in business, psychology and Spanish, Hernandez initially had intentions of going to law school. However, after looking at a saturated legal market, she decided to change course and pursue her MBA, which she completed in 1996 through Metropolitan State University, while working full time. “Part of my graduation requirement was a thesis paper, so I wrote a business plan,” she says. Since she had experience working in the technology industry after graduating from high school, she decided to focus her thesis there. That business plan proved to be the foundation for her IT company of the same name, which she founded with her husband in January 1997. Today, the company provides technology products, professional services, and enterprise solutions to government, education and commercial organizations nationwide. Looking back, Hernandez says she’s focused on growing the business year after year. By making strategic decisions, adding employees, and changing competencies and capabilities, she’s been able to achieve steady growth over time. Fast forward to today and Ideal System Solutions employs 35 people and recently won the largest award ever given to a Minnesota-based business owned by a Hispanic woman — one that could result in “hundreds of millions of dollars in new revenue” over 10 years, Hernandez says. What one quality does Hernandez think has helped her in her leadership of Ideal System Solutions over the past 19 years? Passion. “I’m passionate about the company, how we’re growing the company, and how the team works together,” she says. MN BIZ: What business concerns keep you up at night? HERNANDEZ: It depends on the night! Because the technology industry is always evolving and so dynamic, there’s so many things — every day there are new challenges and rewards. MN BIZ: What’s the biggest setback you have learned from? HERNANDEZ: The past 20 years have been one step back and two steps forward. There haven’t been any major setbacks, but we try things that work and some things that don’t. We are constantly reinventing ourselves. MN BIZ: What are the challenges your business faces? HERNANDEZ: There’s always the challenge of competition. Technology is broad and there’s a lot of large technology companies we compete against. We’ve learned to position and differentiate the company to show a lot of value when selecting us as a vendor or partner. We’ve leveraged being a smaller business to our advantage. It doesn’t work sometimes, but a lot of times, it does work. MN BIZ: What’s most rewarding about your job? HERNANDEZ: Each and every day brings new challenges and new rewards. The fact that our business is to solve our customers’ problems — that’s rewarding. To work with a great team to solve problems and the satisfaction that you get when you can work together to accomplish something is really rewarding.